Recently the television news show, View Point with Kris Pierce, in Omaha, upgraded their studio design. They wanted a modern, professional look that created a brand for the top news stories of the day. Their original set was simple. It resembled a chamber meeting format, hotel draped tables with a brand sign on the wall. 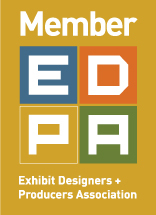 The research staff, of the not-for-profit news station, connected with E&E Exhibit Solutions asking for design suggestions for their television news set. Utilizing one of our custom Nomadic Instand trade show displays with an 8′ curved center and two 10×10 flat walls on either side, we were able to create an affordable look for their news station. Additionally, E&E designed and produced the beautiful trade show graphicsphoto-mural panels to complete the look. “A big thanks to E&E Exhibit Solutions for creating this great wall and donating our set,” Kris Pierce, host of View Point. Trade show displays aren’t just for trade shows any more. They can be used in a variety of ways, such as this news set. Here are a few more ways trade show displays can be used for your business. Curious as to how trade show displays or trade show accessories might be used to brand and market your business? Give us a call – we are here to help. E&E Exhibit Solutions is Expanding! Business growth continues for Tempe-based business, E&E Exhibit Solutions. Opening in October, E&E has secured a third building, this one located in Chandler, AZ, to service the growing trade show rental division requirements. Located at 3215 N. Nevada Street, this additional building not only offers rental and production space but also provides new job opportunities for local professionals.